The Lunar Reconnaissance Orbiter (LRO) Wide Angle Camera (WAC) collects stereo observations by imaging the same area from different angles during many orbits. The apparent difference in positions of features when viewed along different lines of sight is measured and converted into elevation data. This particular topographic map is centered on Orientale, the youngest of the large lunar impact basins. Warmer colors represent higher elevations while cooler colors show lower elevations. Mark Robinson is a professor in ASU’s School of Earth and Space Exploration, LROC principal investigator, and a science team member on a number of missions including NEAR, CONTOUR, MESSENGER and Mars 2020. Robinson contributed this article to Space.com's Expert Voices: Op-Ed & Insights. The Lunar Reconnaissance Orbiter (LRO) was conceived and designed a decade ago to support a human return to the moon. That lofty goal required that the spacecraft produce a diverse set of measurements to provide high-resolution maps of potential landing sites, an assessment of potentially valuable lunar resources like water, and a deeper understanding of radiation hazards future astronauts will face. The Taurus Littrow valley seen obliquely from west-to-east by the LROC NAC. The Apollo 17 crew briefly explored portions of this valley more than 40 years ago. When will we return? LROC is actually composed of three cameras: two identical Narrow Angle Cameras (NAC), and one Wide Angle Camera (WAC). The three cameras are controlled with a small electronics assembly known as the Sequence and Compressor System (SCS). The LROC hardware was all designed and built by Malin Space Science Systems (MSSS), located in San Diego. The original goals of the WAC were to map lighting conditions at the poles over a year and provide an accurate, global, lunar cartographic baseline. It also was to map out color differences due to compositional variation across the lunar globe, at moderate resolution. After lava flooded and filled the lunar mare basins, internal forces squeezed the volcanic basalt rock together and it broke and buckled into a complex pattern of wrinkle ridges that zigzag through the dark mare. The smaller ridges that appear to be growing from under the larger one have almost no superposed craters, indicating a very young age. Perhaps this fault system is still active today? The WAC acquires images in two ultraviolet colors (321 and 360 nanometers) and five visible colors (415 nm corresponding to violet-blue, 566 nm to green-yellow, 604 nm to orange, and 643 nm and 689 nm at the red end of the spectrum). The resolution is moderate, at 1,312 feet (400 meter) per pixel scale in the ultraviolet and 100 meter per pixel scale in the visible, from an altitude of 31 miles (50 kilometer). This softball-size camera maps the whole moon every month, in stereo. These observations are the foundation for extremely accurate new global maps , a necessary tool for future explorers. These maps include monochrome versions at high sun and low sun, and 7-color renderings. Each global map requires mosaicking together more than 10,000 individual WAC images, a complex task undertaken by the LROC team at the ASU Science Operations Center. Since the WAC field-of-view is 90 degrees, there is quite a bit of distortion, especially at the edges of the images — a meticulous inflight characterization of the camera distortion from thousands of images near the poles (looking at areas of overlap) allowed for a geometric correction precise to one-tenth of a pixel (or better). The geometric correction and very accurate spacecraft tracking results in maps that are accurate to better than a half pixel (164 feet, or 50 meters). Just when you think you've seen everything, LROC reveals a natural bridge on the moon! Who would have thought? Natural bridges on the Earth are typically the result of wind and water erosion — not a likely scenario on the moon. So how did this natural bridge form? The most likely answer is dual collapse into an underground void. A global WAC mosaic every month may seem repetitive or excessive. However, the data are not redundant — each month the lighting is different, so the WAC is building up the most comprehensive record of how varying light affects surface brightness ever acquired for any body in the solar system (outside of the Earth). We all have experienced how light varying over the course of a day drastically changes the look and feel of any scene. Many artists have taken advantage of this effect: think of Monet's Rouen Cathedral and water lilies series of paintings. In the case of the WAC, the lighting series has a more practical application: scientists can understand aspects of surface roughness and composition by documenting how the reflectance changes from sunrise to sunset. This translates not only to a better understanding of the lunar surface, but also to airless rocky bodies anywhere. Collapse pits provide valuable views of the shallow subsurface structure of the lavas that filled the lunar mare basins. The farside Mare Ingenii pit reveals layer upon layer of lava flows that flooded the Ingenii basin. The pit floor is inviting, what lies in the shadow — and beyond? Both lighting extremes are potentially valuable to future explorers. Permanent shadows are extremely cold (less than 40 kelvins; minus 388 degrees Fahrenheit) and likely harbor deposits of ice, which can provide water for future settlements. Areas in near-permanent illumination have stable temperatures and ready access to solar power. The repeat observations are more frequent near the poles, since LRO is in a low polar orbit it passes over each pole every 2 hours. From those passes, the LROC team created a time-lapse sequence showing regions that are in permanent shadow and other regions that are illuminated for extreme periods of time (such as mountain peaks near the poles). Finally, this small camera enabled a near global topographic map of the moon — with the exception of shadowed areas very near the poles — at a scale of 100 meters. The fine pixel scale is possible because the topography is measured many times at each pixel. Since the uncertainties in the measurements are mostly random we can take the average of many estimates (on average more than 80) at that one pixel and derive a precise estimate of the elevation. Despite its diminutive size, the WAC can certainly be considered the little camera that could! Oblique view of Tycho crater's central peak. A very popular target with amateur astronomers, Tycho is located at 43.37 degrees S, 348.68 degrees E, and is roughly 82 km (51 miles) in diameter. The summit of the central peak is 2 km (6562 ft) above the crater floor, and the crater floor is about 4700 m (15,420 ft) below the rim. This nearside view of the moon was created with the Lunar Reconnaissance Orbiter (LRO) Wide Angle Camera (WAC) images acquired during a two week period in December 2010. During that time, the orbit track of LRO progressed across the surface from east to west (right to left) allowing for complete coverage. Each of the images was later map-projected onto a digital terrain model of the moon and digitally mosaicked together into this seamless map. The heart of each NAC is a single row, or line array, of 4,996 imaging pixels. That's it, just one row of pixels. The NACs build up a complete 2D image by taking advantage of the 1,600 meter-per-second (50 cm per 0.34 millisecond) orbital velocity of the spacecraft. That single row of pixels is read out every 0.34 milliseconds 52,224 times (taking a total of about 18 seconds) to form a 4,996 by 52,224 pixel image. Each "readout" results in one line of the image. That works out to an impressive 249-megapixel image. This type of imaging scheme is sometimes called "push-broom." Since the NACs almost always image simultaneously and their fields-of-view overlap about 100 pixels, we actually obtain a 9,900 by 52,224 pixel image mosaic (498-megapixel image). Having two cameras also provides redundancy; if one failed we could still meet our requirements. The NAC images reveal startling detail; hardware and astronaut tracks are discernible at all six Apollo landing sites. Due to variations in spacecraft altitude (25 km to 220 km), the nadir- observing (looking straight down) NAC images have pixel scales ranging from 0.25 meters to 2.20 meters. In addition to the small pixel footprint, the NACs have an extended gray-scale dynamic range. Most digital cameras typically record only 256 shades of gray. The NAC records more than 3,200 shades of gray for each pixel, so it can fully capture subtle changes in bright and dark areas within the same image; a critical consideration because the lunar surface has very high contrast in many areas. The combination of small pixel scale and extended dynamic range of the NACs results in the beautiful images on display at the National Air and Space Museum and the LROC website (and more than a million other NAC images currently in the LROC archive). The Apollo 12 landing site in Oceanus Procellarum, now known as Statio Cognitum. Here, you can see the remnants of not one, but two missions to the Moon. Astronauts Pete Conrad and Alan Bean demonstrated that a precision lunar landing with the Apollo system was possible, enabling all of the targeted landings that followed. Bean and Conrad collected rock samples and made field observations, which resulted in key discoveries about lunar geology. They also collected and returned components from the nearby Surveyor 3 spacecraft, which landed at this site almost two and half years before Apollo 12. The LROC experiment is an overwhelming success. Its three cameras accomplished much more than the original objectives, and are still enabling groundbreaking science as it continues mapping the moon. 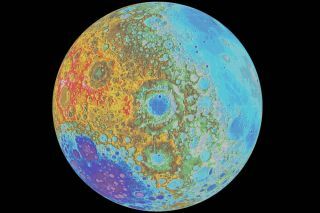 a map of permanently shadowed regions, global topography, the first detailed ultraviolet map of the moon, and high-resolution maps and topography with startling ground coordinate accuracy. Scientific discoveries from the LROC images include new insights into the physics of impact- crater formation, discovery of very young volcanic features, confirmation that the moon is shrinking, discovery of silicic volcanoes, a new understanding of how light interacts with the surface and much more. However, the technical and scientific discoveries of LROC are not the subject of the National Air and Space Museum show. Rather, it is the revelation of the moon as a beautiful and engaging world in its own right that is the theme of this small collection of images. The lunar landscape can be dramatic, engaging, mysterious, wondrous, and at times, confusing. The whole character of a single landscape can appear foreboding, friendly or inspiring as the light changes through a lunar day. But in every case, the moon is seen as an alluring destination, somewhere I want to go and explore. It is my hope that the LROC images will reveal a moon that you never knew existed. There is no doubt in my mind that humans will someday return to the moon, and then move outward to Mars and beyond. The big questions are — by whom and when?